mmsonline.com December 2017 MMS 79 FEATURE M ost metalworking facilities are high-mix, low-volume businesses. Batches tend to be small, while the variety of parts produced is quite high. New processes for incoming jobs need to be developed on a regular basis. Therefore, metalworking facilities must be careful when they consider the capabilities of the capital equipment they purchase and the skillsets of the people they employ. The wrong mix of equipment and people can leave either asset underutilized. Productivity will suffer. However, the right mix of equipment and people can help increase productivity and enhance flexibility, thus significantly improving a shop's profitability. The 2018 Capital Spending Survey by Gardner Intelligence shows that in recent years shops have increasingly turned to horizontal machining cen- ters (HMCs) for this increased productivity and process flexibility. The survey provides quantita- tive evidence supporting the shift to HMCs that this magazine has noted in recent years. 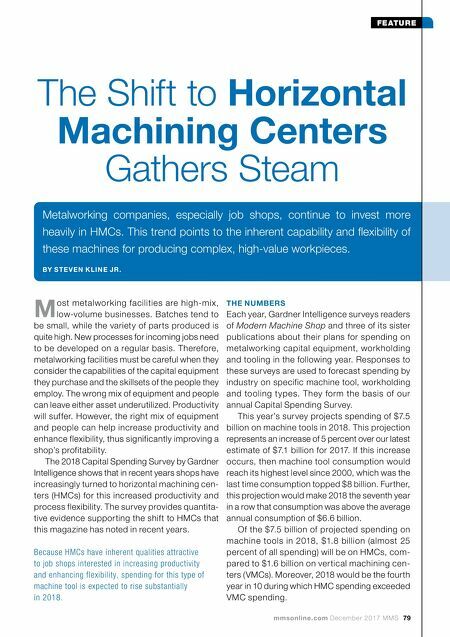 The Shift to Horizontal Machining Centers Gathers Steam Metalworking companies, especially job shops, continue to invest more heavily in HMCs. This trend points to the inherent capability and flexibility of these machines for producing complex, high-value workpieces. BY S TE V E N K LI N E J R . THE NUMBERS Each year, Gardner Intelligence surveys readers of Modern Machine Shop and three of its sister publications about their plans for spending on metalworking capital equipment, workholding and tooling in the following year. 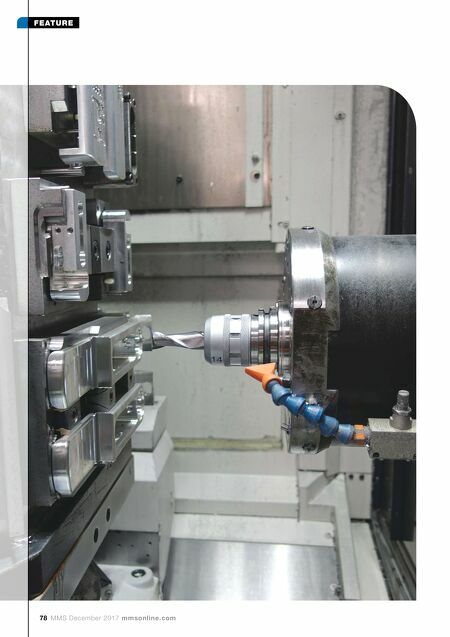 Responses to these surveys are used to forecast spending by industry on specific machine tool, workholding and tooling types. They form the basis of our annual Capital Spending Survey. This year's survey projects spending of $7.5 billion on machine tools in 2018. This projection represents an increase of 5 percent over our latest estimate of $7.1 billion for 2017. If this increase occurs, then machine tool consumption would reach its highest level since 2000, which was the last time consumption topped $8 billion. Further, this projection would make 2018 the seventh year in a row that consumption was above the average annual consumption of $6.6 billion. Of the $7.5 billion of projected spending on machine tools in 2018, $1.8 billion (almost 25 percent of all spending) will be on HMCs, com- pared to $1.6 billion on vertical machining cen- ters (VMCs). Moreover, 2018 would be the fourth year in 10 during which HMC spending exceeded VMC spending. Because HMCs have inherent qualities attractive to job shops interested in increasing productivity and enhancing flexibility, spending for this type of machine tool is expected to rise substantially in 2018.